Top performance at a budget price point. 116L. I use KMC chains in both 8 and 9 speed and they are fine. Merlin's price and delivery were excellent. An excellent chain that will certainly boost the performance of your drivetrain. Thanks. KMC chains as reliable as usual. Good service from Merlin order arrived promptly. Have been using these chains since the start of the year, and they appear to last as well as the Srams I had been using. Oh and the price is much better. Terrific exchange for my ageing chain. Runs smoothly and good value for money. At this price it's not a massive expense to replace the chain as soon at the chain stretch gauge suggests it's time to change. This replaced a KMC chain my LBS fitted so I can't comment on longevity, but I've had no issues with KMC chains in the past. Nice, cheap replacement for an old Shimano chain on my stationary bike, which works just as well as the original. The fact that KMC bundles a "Missing Link" into the package makes it a no-brainer. Excellent chain. That's the second KMC chain I use. Smooth gear changes (with shimano tiagra groupset), reliable and cheap. Nothing to complain about. I bought this because I was happy with the original one I've used for two years, in that time it's been ridden for 3500 miles. I used dry lube for the first year and then changed to wet, oil based lube for the second year. It's been lubed frequently, never been 'dry' and been cleaned a few times. I checked the new chain against the old one, and found the older one is longer by about 4mm over 106 links, so not badly worn in my opinion. The old one I've kept as a good spare. The chain does what it's supposed to do, runs quietly (better with wet lube), and changes well. The re-usable link has been removed several times and not given any cause for concern or complaint. Works nicely with my old 9 speed Shimano LX set up mtb. Blows away Shimano on price, ease of set up, removal and performance. Excellent chain, no noise and very fluid. What's not to like? It's a decent priced chain, that works well with my Shimano drivetrain and seems to last well. Quick link means it's easy to take off and clean. Got KMC chains on both mountain bikes and my road bike; seem to last longer than SRAM chains and Shimano don't have a quicklink option. Great budget chain. Have had 2 of these in the past and seem to wear very well. The current one has done 3 months of Lake District mud riding and 6 months of australian dust and is now time for a replacement due to stretch. Always had KMC chains for the last three years. Never snapped one yet and they wear really well. You can't go wrong with them. Brilliant piece of kit - rides and shifts very smoothly but goes on even smoother especially as this is the first time I've ever changed a chain. Split link makes this a complete doddle. Good quality chain at a very decent price. Dispatched quickly. Chain was easy to fit to my bike, overall great product. Does what it says on the Tin really. More a review of Merlin than the product, 1st time using Merlin and have been impressessed. Good value product and great delivery time. Absolutely love these chains. My last one lasted many many months of wet muddy abuse and didn't take the rear cassette with it when I did replace it. I'd have got through several SRAM or Shimano chains and cassettes in the same time. I ordered three chains at two pm and they were delivered the next morning, what more do you want, and they were the cheapest. excellent !!!!!!!!! Great service again from Merlin. Chain seems fine - it did snap on its 3rd run out in fairness but I think thats because I added a link and maybe didnt seat the pin as well as I should have! Good quality stongnchain with missing link included. Runs almost silently on Shimano setup. Light, easy to adjust. KMC are in my opinion the best chains. Merln as usual dispatched rapidly. Good solid chain, links are definitely harder to push out than SRAM/shimano chains which should give a better reliabilty in the long term, shifts nicely too. Excellent chain at a good price , prompt delivery of product and good transaction. This is the first time i have tried these chains ,my first impression is that they are very good .They were recommended to me by a friend..Merlin are always very competitive on price and i find the delivery service outstanding. Very pleased with the quick delivery. So quick, in fact, that I haven't had time to put it on the bike yet. 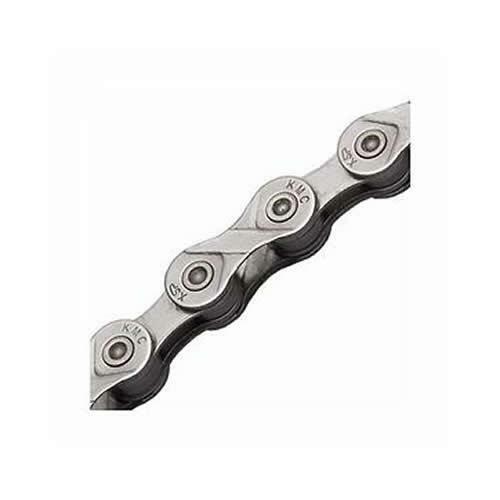 Perfectly functional 9 speed chain with a quick link - why pay more? Strong, reliable chain at a great price. Smooth precise shifting and long life. Used on my DH and 4X bikes. at 10 bucks a go you cant go wrong. KMC chains have always been super reliable for me and ive only ever snapped 1 unlike Sram and Shimano. May not be the lightest chain in the world but if you want something that lasts just buy one. A dependable chain that lasts well. Fast delivery as always from Merlin. Excellent service and price. Not used yet but from previous experience KMC 9 speed chains outlast Shimano equivalents. Cheap chain and comes with removable link, I like to take my chain off to clean it after rides so this is a must for me, better chains out there but not at this price. Just about the best chains I've used. I used to break Shimano or SRAM chains all the time, one would last me about 3 months or so. These just never break, and they hardly stretch either. You can really take the abuse. best price by far, I didn't expect the recorded delivery. I will recomend this site to everyone. thanks.